If you dig the growth mindset and Jo Boaler’s course, this post is for you. Here are a few activities to get students thinking about their mindset. The ideas are derived from Carol Dweck’s work which is referenced extensively in Jo Boaler’s course How to Learn Math. With more than 20,000 enrolled chances are you are taking the course with me, but I thought it would be helpful to share a few activities on mindset and attribution retraining—a fancy phrase for how to move students from a fixed to growth mindset. Since 2011, the district I work in has offered a graduate level course called The Skillful Teacher. I’ve taken the class and I’m finding strong similarities between the two courses with respect to mindset and feedback. The Skillful Teacher required extensive “homework” so that’s given me an opportunity to share a few activities that you can use, abuse, or refuse. By the way, Algebra’s Friend has written a fine overview of Session 1 on Boaler’s course. I would appreciate everyone who’s taking the course to chime in there and here so we can learn even more. 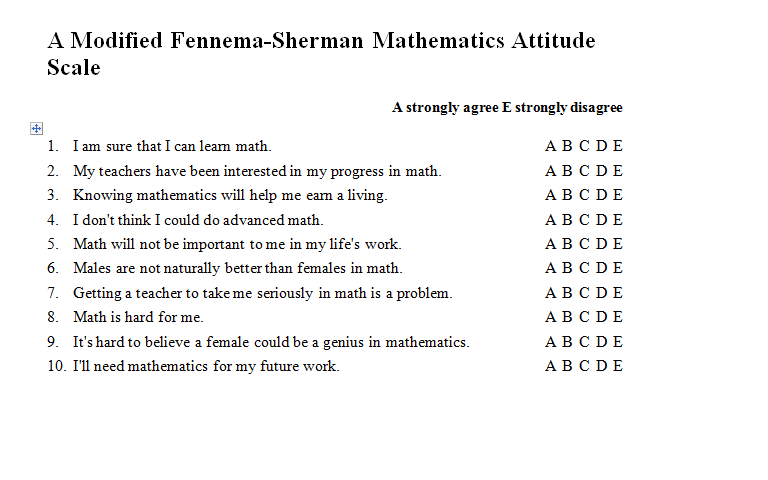 Here’s a Mindset Quiz I retyped from this document. It’s a self assessment that students score themselves. The card sort activity introduces students to growth and fixed mindsets. Cut the statements into strips. Mix them up for students to sort into two categories. 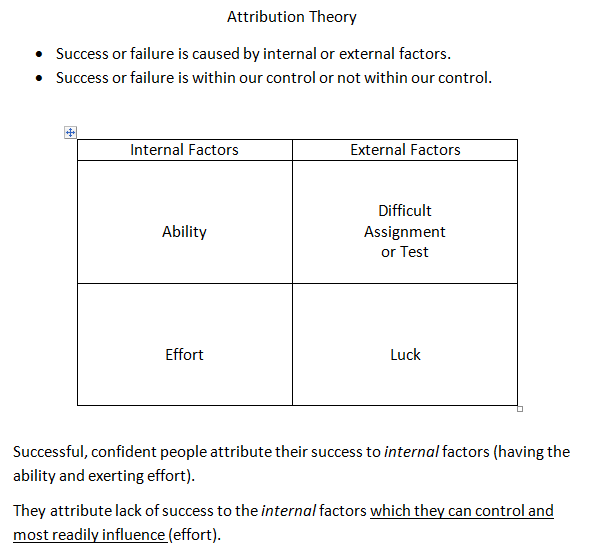 Using a T-chart, students will brainstorm what makes a successful and unsuccessful student. From the list the teacher will frame the rest of the period doing 4 corners—asking who thinks success is due to effort; who thinks success is due to luck, who thinks success is due to ability, who thinks success is due to how easy or hard the task was. Assign a Think-Pair-Share activity to create situations where only effort was needed to complete the task, only luck, only ability, only the difficulty of the task at hand. Students share scenarios and agree or disagree using a human continuum. This handout is a related activity. Note: it doesn’t get into stable or unstable causes of success or failure. This brief article from Health and Science News You Can Use can be used for a class discussion on how the brain learns. Here are some comprehension questions as well. To be honest I haven’t used this. It is something I stumbled upon a couple of years ago. The intent was to give it to students and score it using Mastery Manager. If you have resources to share I would love to hear about them. Previous postI’d like to thank the academy for the Liebster Award! Mary!!! I just worked through session 2 … and then took my Mindset book outside and skimmed a few chapters. As I came back in the house, I was thinking I needed to do some activities related to mindset on the very first day of school. And bless you … there they are! I’ll be using some of your ideas for sure. Thanks, Beth. I appreciate it. Thank you for posting this! I’m also taking the course (like you said, plenty of people are). I could definitely see myself using these. Some activities could be used “right off the shelf”, others may need to be adapted. We’re in this together 🙂 so I’m happy to help. Thanks for taking the time to check out the post. We’re all incredibly busy and I appreciate it. I appreciate the links! For the reading crowd, literature teachers may want to carve time from their curriculum to share excerpts from the book Right Words at the Right Time. It features brief, celebrity essays in which the celebs describe words that lingered and inspired them. Given my 7th graders, there are some that I wouldn’t use in the classroom, such as a teacher telling Mohammed Ali he wouldn’t amount to anything or Carlos Santana’s family upbringing, but there are several worth sharing in class then having students write their own Right Words at the Right Time. Your mention of the #howtolearnmath twitter community got me thinking that I should share this post. Perhaps I will. Thanks for stopping by! Math autobiographies are a great idea! It would be interesting for them to write about the math messages they’ve heard over the course of their lives. Identify some turning point either in a positive or negative direction, etc. Mary, thanks so much for sharing! This is awesome! Do you have the article on growing your own intelligence? The link takes me to your other document. Thanks! Oops! I fixed the link, but here it is. Thanks for proofreading!!! I try to check all the links before publishing, but this one got past me. I appreciate you stopping by. We were looking for examples of attribution retraining during an Administrator’s meeting and I found this post. Thanks so much for a great example!